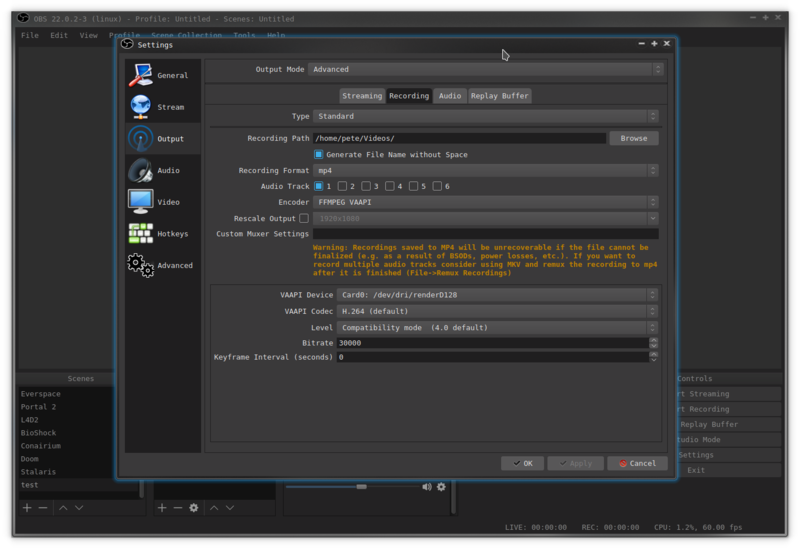 Does OBS use ffmpeg as a library, or it calls ffmpeg binary itself? Shmerl Does OBS use ffmpeg as a library, or it calls ffmpeg binary itself? I think the install instructions ask you to ensure that ffmpeg is installed, so I'd assume the latter. I think it's been available as a standalone patch for a while. On Debian Sid I have not had access to VAAPI but I'm thrilled it's finally coming. Maybe your distro has been applying the patch on their OBS releases? There have been special builds out there with it as it was merged a while ago but it is only now in an official release, well candidate anyway. That would make sense since they're the one who did the patch to OBS from what I remember. Ooo, VAAPI sounds great! I didn't know it was coming. Although, game capture was one of the reasons I upgraded my CPU last year, so I already don't feel it anymore. I'm more excited about the audio features (especially multitrack, whatever that means exactly, and a built in limiter). Due to the lack of any audio plug-in support we are pretty much limited to the built in effects unless you go to great length and try to get OBS to work nicely with external effects (JACK, PolypAudio). I'm not too familiar with the VAAPI details. Is it not detrimental to the performance of the GPU for games? Is the encoding quality on par with CPU encoding? The release notes don't mention any bug fixes, so it's hard to say what the feature vs. fix balance looks like. I'd rather have them fix their bugs and improve their codebase than add features. Try running OBS in Valgrind if you are up for a little shock.